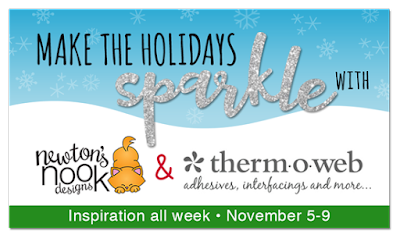 Today we are featuring projects by Holly and Naki! 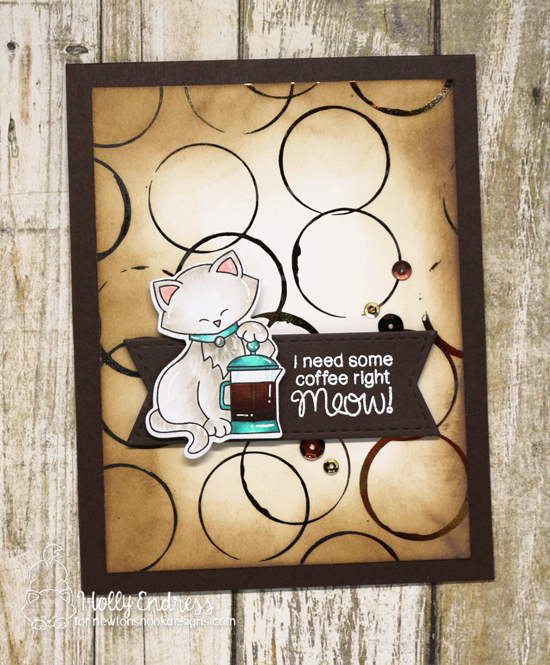 For her first card, Holly featured the cute kitty and coffee press from our Newton Loves Coffee Stamp Set. She colored the image with copics and added a few white gel pen details. Then she cut it out using the coordinating Newton Loves Coffee Die Set. For the Fun foiled background she used Brutus Monroe Designer Toner Sheets (Coffee Rings) with Amber Watercolor Deco Foil from Them O Web. She also added the sentiment from the Newton Loves Coffee Stamp Set, embossed in white on a banner that was cut out using our Frames & Flags Die Set. 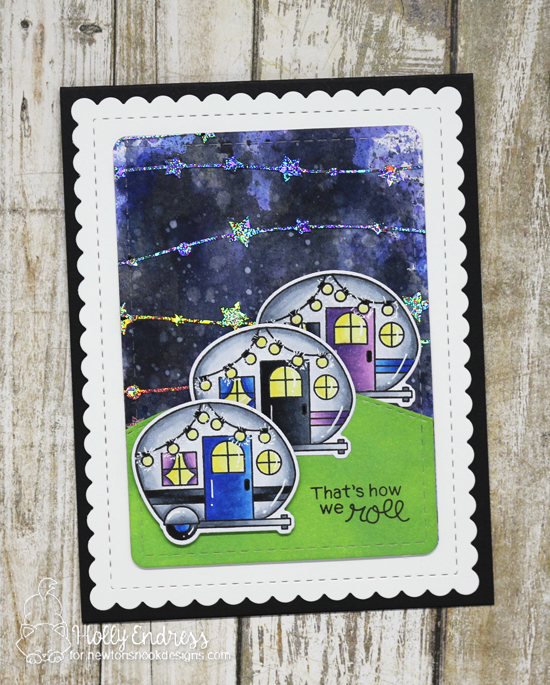 For her second card, Holly created a lovely night camping scene! She used those cute campers from our Cozy Campers Stamp Set, coloring them with copics and adding fun details with a white gel pen. She then cut out the campers with the coordinating Cozy Campers Die Set and added them onto her night scene. To set the scene she created a fun starry background using For the Fun foiled background she used Designer Toner Sheets (Starry Night) along with Silver Stars Deco Foil from Them O Web. She layered this over a dark distress inked background and also added a hill using our Land Borders Die Set. She also cut out the rounded rectangle and scallop edged rectangle using our Frames & Flags Die Set. Visit Holly's blog: Holly Beary Creations to see more and leave a comment for another chance to win! 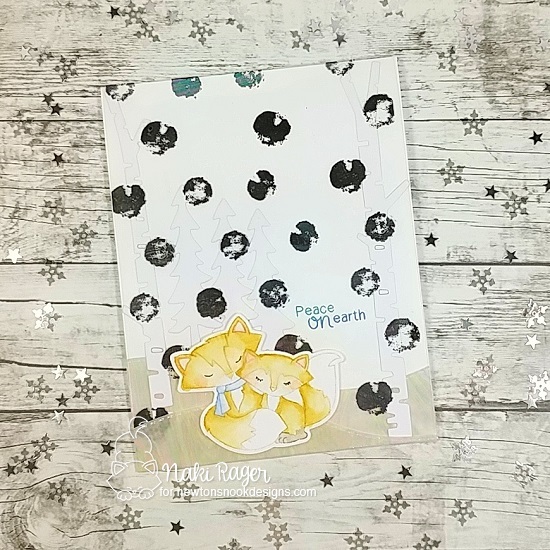 For her first card Naki created an adorable winter scene featuring that sweet pair of foxy friends from our Fox Hollow Stamp Set. She colored the foxes with soft watercolors and cut them out with the coordinating Fox Hollow Die Set to add them to her card. For her card she created a winter scene by adding birch and pine trees in white that were cut out using our Forest Scene Builder Die Set. To add the sparkly dots she used Brutus Monroe Designer Toner Sheets (Distress Circles) along with Silver Deco Foil from Them O Web. She also created subtle sparkly hills using our Land Borders Die Set and adding on Iridescent Deco Foil from Therm O Web. For her second card, Naki created a gorgeous red foiled background using Gina K Designs Foil Mates (Holiday Flora) and Red Deco Foil from Therm O Web. Then she layered a fun teal ornament shape on top that was cut out using our Ornamental Shaker Die Set. She added on a gold glittery top and embossed the sentiment from our Ornamental Wishes Stamp Set in gold too! So sparkly and perfect for the holidays! I'm sharing Holly's card in the Coffee Loving Papercrafters FB page! Such amazing creations! I love the coffee card so much!! Foiling really adds a special touch to these cards. Wonderful creations by Holly and Naki! Lovely cards! :) I really like that coffee one. The kitty making coffee is very cute. I also love the red background Christmas card. Great color! Stunning cards from both designers! You had me at coffee! lol Gorgeous projects by both Holly and Naki. The foiling adds a pretty touch. The coffee rings card is darling. Ohh... some of my favorites here in today's post, thanks for sharing! Such fantastic cards! I love the addition of foil to these cards!